The spin-columns have a silica-gel membrane in them to remove salt and contaminants. 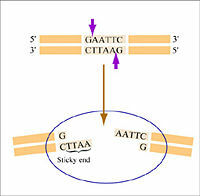 The membrane binds DNA in the presence of salt, and DNA can be efficiently recovered from the membrane once the salt is removed. All the necessary binding and wash buffers are sold with the Qiagen spin-columns and they have unusual and uninformative names like "PB" and "P2". The contents of these buffers are proprietary so we don’t know precisely what they contain, but there is some information about them that is included as part of the protocol. This should help you understand the steps - be sure to think about the instructions rather than blindly following them. Today you will use the Qiagen “QIAquick” protocol to clean the DNA you generated by PCR. 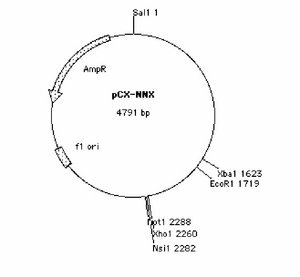 You will then digest the PCR product as well as some purified plasmid (provided by the teaching faculty). 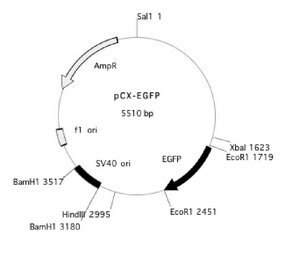 The purified plasmid will be used as a backbone in which to clone the truncated EGFP that you obtained by PCR. Once the restriction digests have been set up, we will have an interactive introduction to scientific communication from our class writing instructors, Neal Lerner and Linda Sutliff, and our oral presentation instructor, Atissa Banuazizi. If you have time before they arrive (and your lab notebook is up to date! ), you can look at the major communication assignments we have on tap for this term. 1. Figure: Draw a plasmid map of the clone you are trying to create. Include all the restriction sites that will be introduced. List the sizes you would predict for the fragments generated by an EcoRV/XbaI double digest and a BamHI/XhoI double digest. This homework will be the template for Figure 5 in your progress report. 2. Question: Why was the concentrated buffer added to the water before the enzymes? 3. Question: From the NEB website, you know that XbaI has 0% activity in NEB1 while EcoRI has 100% activity in all 4 NEB buffers. So what would you predict as an outcome from your cloning experiment if you accidentally used NEB1 instead of NEB2 today? What have been your experiences with scientific writing (e.g., lab reports, research articles, reviews)? With other writing tasks? What have been your experiences with giving oral presentations (whether scientific or not)? How would you describe yourself as a writer? As a public speaker? What are your writing/speaking goals for 20.109? This page was last edited on 17 September 2009, at 12:56.